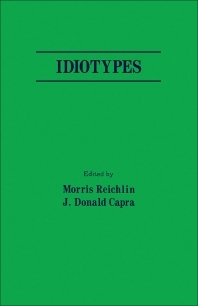 Idiotypes documents the proceedings of an International Conference on Idiotypes held in Oklahoma City, Oklahoma, at the Oklahoma Medical Research Foundation, October 20-23, 1985. The aims of the conference were to gather active investigators in the study of idiotypes; to assess progress in the field; and to explore directions for future research. The papers presented at the conference cover a wide range of subjects. Several papers deal with defining protein and DNA sequences which determine idiotypes. Evidence points to germ line genes encoding the V region structures which underlie idiotypy. Another subtheme which concerns several contributions is the occurrence of dominant idiotypes in induced immune responses (e.g., arsonate and lysozyme) and autoimmunity (e.g., thyroglobulin and rheumatoid factors). The presence of such dominant idiotypes is discussed from several viewpoints, but the recurrent theme is that such dominance is a manifestation of a selection process inherent in the idiotypic network. Two papers deal with idiotypic structures in T cells: on the one hand, identifying idiotypes on T helper cells and, on the other, I-J and Iat related structures which tightly govern cellular interactions in the evolution of an immune response. Network interactions through autoanti-idiotypic responses are shown to be associated with the effects on the specificity of both induced and naturally occurring immune responses. Autoanti-idiotypic responses are also shown to be correlated with the regulation of the anti-DNA response in human systemic lupus erythematosus. These data pointed to a role of the idiotype network in immune regulation.